Roger Evans was the son of William Arthur Evans (1865 – 1942) and Annie Evans, née Goddard (1882 – 1974). He joined the Imperial Typewriter Company, Leicester, founded by his father, becoming Works Director and joining the Board. Within the company and the industry he specialised in production engineering, becoming a Member of the Institute of Production Engineers and chairing the Institute’s Materials Utilisation Sub-Committee. 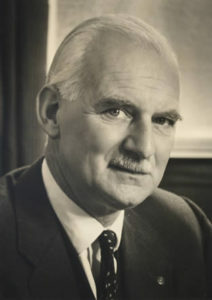 He joined the Lit and Phil in 1946 and followed his father, President of the Society for 1913-14) as President of both the Lit and Phil (1962-63) and of the Rotary Club of Leicester (1964-65). Sources: Production Engineers Journal 1956 & 1959. His death is noted in the Annual Report of the Leics. Archaeol. & Hist. Soc. For 1968.